What can I say? 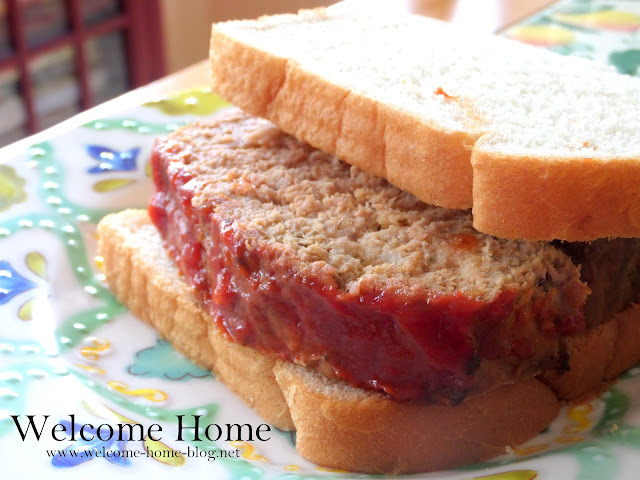 What is more all American than a classic meatloaf sandwich? It is the ultimate comfort food and it gets better each day it waits for you in the refrigerator. I keep mine simple. No extras, no condiments, no lettuce or anything else. Just the ketchup on the meatloaf between two slices of white bread. Now that's a sandwich! 3/4 cup saltine cracker crumbs, finely crushed or use bread crumbs finely processed. Preheat oven to 350 degrees. Lightly grease a 5 x 9 inch loaf pan. Press the brown sugar in the bottom of the prepared loaf pan and spread the ketchup over the sugar. In a mixing bowl, mix thoroughly all remaining ingredients and shape into a loaf. Place on top of the ketchup. Bake in preheated oven for 1 hour or until juices are clear. Slice and serve with mashed potatoes and a side veggie. The next day slice it up for a wonderful sandwich. Remember, meatloaf only gets better each day! Four pages, including several color pictures, is not printer friendly. Even as a PDF, the recipe itself straddles two pages. You click on the print friendly button, the go to the top of the page and print without images. Select the size and whatever other settings you like.